Hampshire College's new R.W. Kern Center is about as sustainable as a building can be. 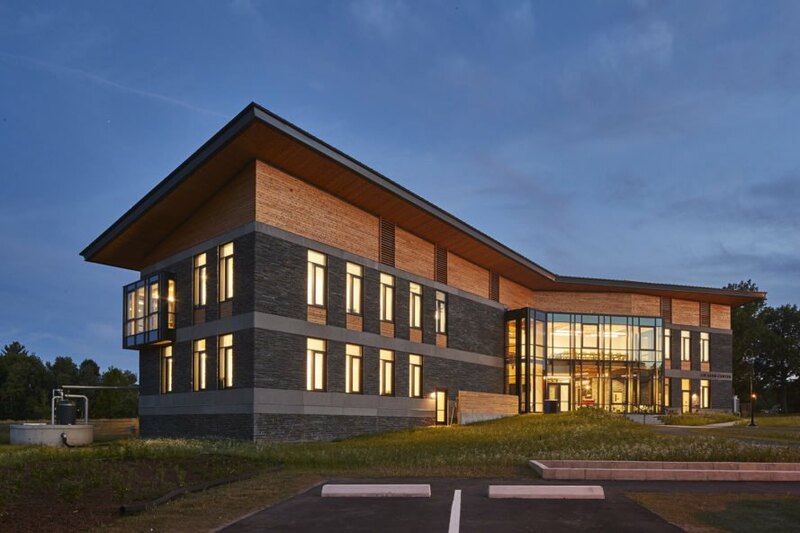 The 17,000-square-foot center, designed by Bruner/Cott & Associates, is designed "to be entirely self-sustaining and meet the Living Status of the Living Building Challenge." To reach for those goals, the center runs on solar power, is outfitted with composting toilets, and includes a rainwater harvesting system. Kern Center functions as a hub for student life with a “community living room” and cafe, and it also serves as a welcome center for parents and staff. Floor-to-ceiling windows connect those inside with the trees and wildflower meadow outside. Two wings clad with stone add natural beauty to the center. The stone and wood utilized were sourced locally. According to Bruner/Cott, all the building materials are “Red List compliant” and they avoided products containing toxic chemicals. The building materials aren’t the only green aspects of the Kern Center. A rainwater harvesting system allows for net-zero water, and the roof is decked out with large solar arrays. 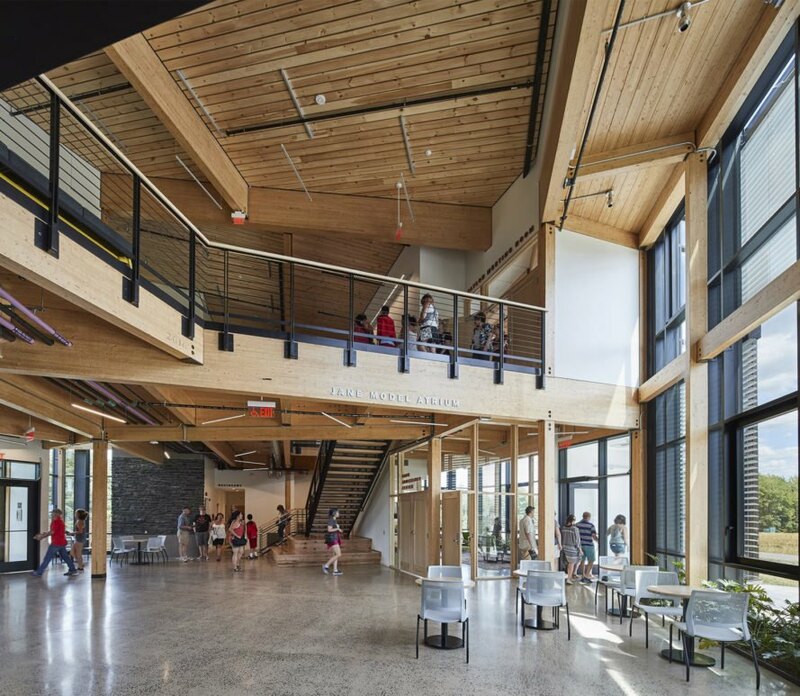 In the words of Hampshire College, the Living Building Challenge is the “world’s most advanced green building standard.” Should the Kern Center be certified, it will move Hampshire closer to its goal of going carbon-neutral in the next four years or less. Kern Center was built with local wood and stone. The design is meant to connect those inside the building to the nature outside. Rooftop solar panels power the building. The building also includes rainwater harvesting to allow for "net-zero water." Floor to ceiling windows add beauty. All the building materials were "Red List compliant." Kern Center also functions as a "teaching laboratory" where people can learn more about the building's sustainability features. 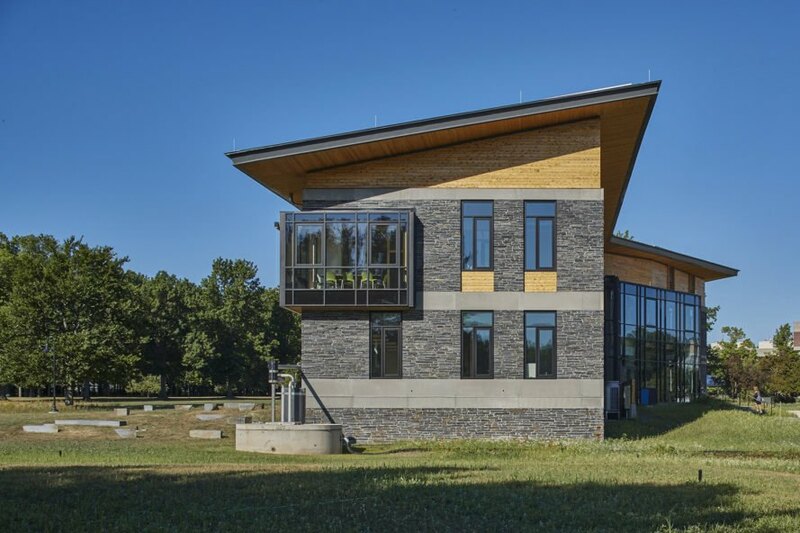 Hampshire College aims to go carbon neutral in the next four years or less. Kern Center functions as a hub for student life with a "community living room" and cafe, and it also serves as a welcome center for parents and staff. Floor-to-ceiling windows connect those inside with the trees and wildflower meadow outside. Two wings clad with stone add natural beauty to the center. The stone and wood utilized were sourced locally. According to Bruner/Cott, all the building materials are "Red List compliant" and they avoided products containing toxic chemicals. The building materials aren't the only green aspects of the Kern Center. A rainwater harvesting system allows for net-zero water, and the roof is decked out with large solar arrays.